Our 18 years of experience in the counterfeit document detection industry means we have a lot of conversations with business owners, government entities, law enforcement officials and – mostly – loss prevention professionals. 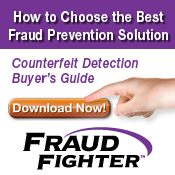 FraudFighter has been selling ultra-violet (UV) document authentication since the company was founded, and we are constantly being asked whether UV will continue to be effective as a method to deter counterfeit fraud and identity theft. As evidenced by the fact that governments from around the globe continue to add intricate UV security features to their secured documents. Whether currency notes, national ID cards, passports or visa documents, we see a steadily increasing level of intricacy and design acumen being used as important documents are being secured with UV features. UV features are here to stay. Take a look for yourself: Here’s a sampling of the thousands of currency notes and I.D. documents from across the globe that were updated in the past couple of years. Notice how each of them still depend on UV features as a security measure. This Australian 10 dollar note was issued on September 20, 2017. The enlarged area shows what the boxed area looks like under UV light. After the US dollar, the euro is the most traded currency in the foreign exchange market. Currently 19 European countries use the euro as their sole currency. This 50 euro note was issued on April 4, 2017. The enlarged area shows what the boxed area looks like under UV light. This Chinese 10 yuan note was issued on November 26, 2015. The enlarged area shows what the boxed area looks like under UV light. This Argentinian 10 peso note was issued on March 10, 2017. The enlarged area shows what the boxed area looks like under UV light. 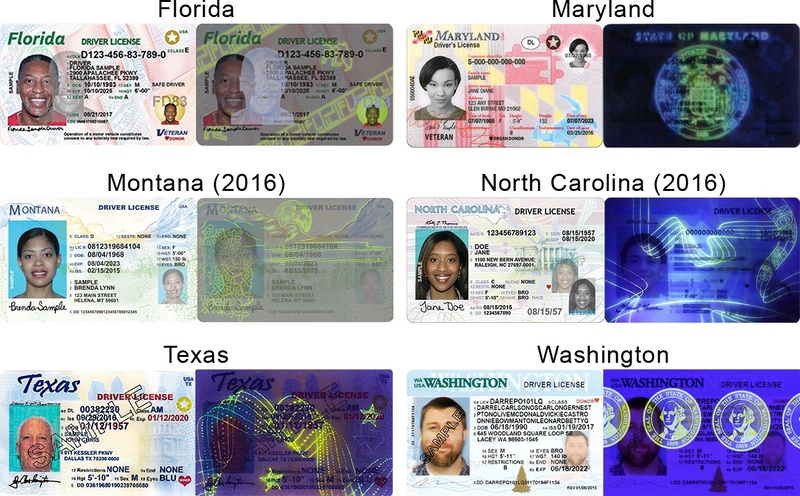 For each state, the left shows what the driver's license looks like under white light and the right shows what the driver's license looks like under UV light. Montana and North Carolina released their designs in 2016 and Florida, Maryland, Texas, and Washington released their designs in 2017. Several states released new designs for their driver's licenses (and identification cards) this year. With the upcoming implementation of Real ID, more states are sure to release new designs within the next year or two. UV features are, and will continue to be, heavily relied-upon as a security feature for state-issued driver's licenses and identification cards. 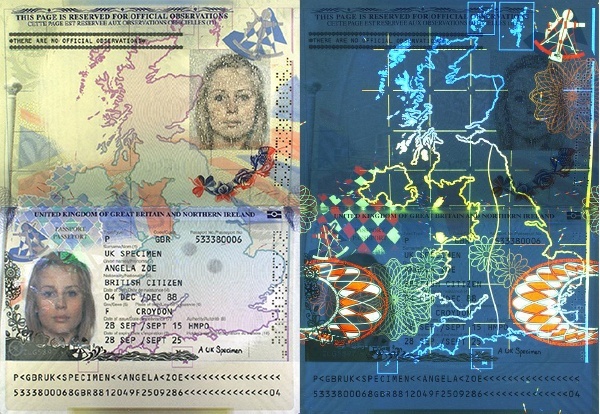 The United Kingdom released their new e-passport in December 2015. This new UK passport is considered by many to be the most secure passport in the world. 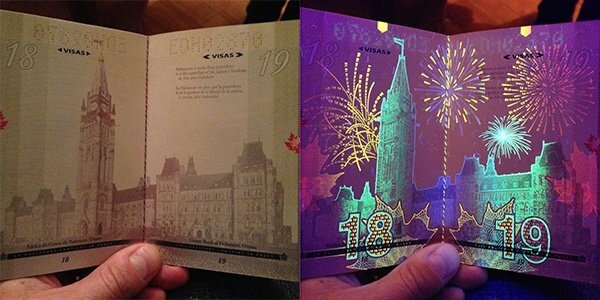 When Canada’s new passport was released on July 1, 2013, the entire world was in awe: every page has intricate, colorful UV designs. Try searching “Canada passport UV” or something similar and take a look at just how many articles there are praising the designs. Above is just an example of one of its amazing UV designs; you can see the rest by clicking here.